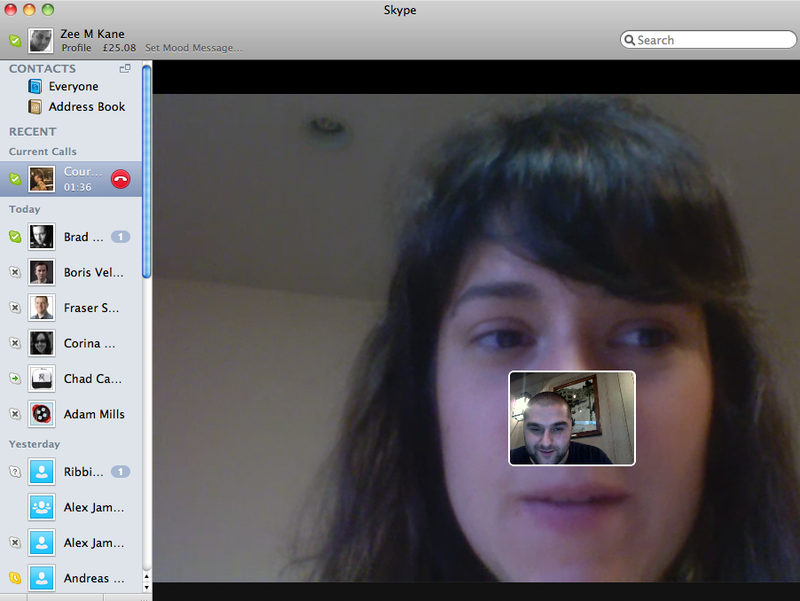 The new Skype 5.0 beta for Mac was released today and has spawned a flurry of angry commentary. After a few hours of playtime we’ll share our complete review. This is as small as I could shrink the Skype screen. You’ll notice it takes up a considerable amount of space in comparison to the old Skype. Skype contacts are now listed by date of last conversation on the left hand side with the chat featured on the right in the same window. The complete list of contacts sits on top under “everyone.” You have to pop out a list of your Skype contacts that are currently online, a piece of information that was readily visible before. But for video chat, the bigger Skype is better. While we’ve seen this feature on Skype for Windows, the update for Mac OSX’s Group Video Calling feature allows you to conduct video-chat calls with up to 10 people at a time (as long as all participants are on the new Mac beta or Skype for Windows 5.0). This feature also includes the ability to host conference calls. A successful group video call only works as well as the connections and hardware found across a group of contacts. When in a video conference, the new Skype’s group chat feature is so subtle in the video calling box that it’s practically hidden. You have to drag the small three lined icon up that sits on the bottom middle of the screen. And the obvious: the group video chat eats up bandwidth. A new call control bar includes “Hang up,” “mute” and more from a mini Skype toolbar that sits on top of any web pages, documents or photos you’ve got open. Skype added Offline IMing so that you can send and receive instant messages even if the recipient is offline and a “Floating Contacts Monitor” to see your online contacts and contact groups. And if your internet is shoddy, Skype has added the ability to quickly rejoin calls if your Internet connection fails momentarily. This is brilliant. We’ve also noticed a few new emoticon options in the bottom right hand corner of the chat. The new Skype loads faster. Also searching for contacts is easier on the new Skype, and its practically instantaneous. My favorite feature is Skype’s integration with the Mac address book. I can only hope that a new Skype app for iPhone will have this feature too. If you don’t use your Mac address book, Skype has added the ability to personalise contacts via user profiles, which means that you can manually your friend’s non-Skype cell phone numbers for easy calling access. Preferences are mostly unchanged from the old Skype and to disable Growl settings (just like the old Skype) you need to disable particular notifications, see below. Unfortunately a simplified Skype means you can only see one chat conversation at a time. Also, within that one chat conversation, the only picture is of the person you’re talking to, versus traditional chats on Adium, gChat, or iChat when both person’s pictures identify who said what when scrolling through conversations. The UI takes some getting used to, and the entire size of the new Skype is annoying. The new Skype looks more like a window in a browser, so it would be interesting if we could just download a chrome extension that would let it be just that. If you don’t really do group chat and you don’t mind a gigantic window (and all the other flaws), it may be a good upgrade for you. See Skype’s video demonstration of its new features here. To celebrate the release of Skype 5.0 for Mac in beta, Skype is giving one lucky winner a $1,500 gift certificate to the Apple store. Click here to enter to win.